Cell phone payments are rising and according to Forrester Research, cell phone users are estimated to be around 5 billion by 2017 and mobile payments are estimated to grow to $90 billion in 2017, from $12.8 billion in 2012. Phone companies are either entering this lucrative market or shifting their focus to leverage this growing market and increase revenues. Some of us already use the NFC (near-field communication) technology on our phones to make in-store purchases. An example is the Starbucks mobile app which allows us to link our cell phone to our Starbucks store card and just hold our phone close to a receiver at a Starbucks cash register to make purchases. 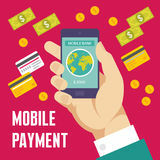 But, the mobile payment market is about to explode soon and help consumers with cell phones to make secure payment anywhere that they can make purchases with credit cards. Apple has announced a partnership with Visa, MasterCard, and American Express as well as major credit card companies about a mobile payments system called Apple Pay which will allow iPhone users to link their phones to their credit card accounts and make purchases everywhere using their iPhones or Apple Watch. This partnership will affect about 80-90% of all payments. As we had guessed, Apple will use the NFC technology utilized by other mobile payment options such as Google Wallet to make in-person purchases. For Apple, entering this growing market is a no brainer since they already have millions of registered credit cards which can be linked to the payment app and help iPhone users make cell phone payments. Apple currently has 500 million users which is second to Facebook which has about one billion users, however, Apple users contribute more in revenue per account than any other company. Amazon is second and Facebook is last when it comes to revenue per user account. This new payment strategy is inevitable and it will be embraced by consumers and businesses. But the mobile payment direction will also have some implications. The rise in the number of cell phone users along with the increased use of the mobile payment technology to make cell phone payments will probably lead to increased cell phone theft and fraud which users have to be educated about as they start linking their cell phones to their credit cards and using their cell phones to make payments. Cell phone security and related software will also be improved as the mobile payment technology takes off, however, I suspect that users will not be educated as in the past about the risks and precautionary steps that they can take to reduce the risk. Cell phone payment security will continue to evolve and improve in some ways and make our wallets lighter as it will consolidate our credit cards into one single payment mechanism on our cell phones although it is expected that there will be more mobile payment technology providers. That said, I also suspect that security will slowly be taken out of the users' control because they are the weakest link on the chain. For example, password may be replaced with fingerprints or thought vibrations and the security process will be automated and forced upon users. For example, Apple cell phone users will be forced to use Touch ID to access the phone, or, phones will be programmed to time out the payment application sooner rather than later. In addition, when cell phones are lost, all payment data can be remotely wiped out to prevent identity theft or when credit cards are lost, the phone can de-link the lost credit card. In case you missed it, here is the latest statistics for smartphone theft cell phone payments.